Each week we highlight a few of the more interesting items in the upcoming Aldi ad. Note that, in our area, the ad takes effect on Wednesday, but in some areas it may take effect as early as today, Sunday. This week’s theme includes office furniture and accessories, tools and gear for the garage or workroom, kitchen gadgets, and home items. 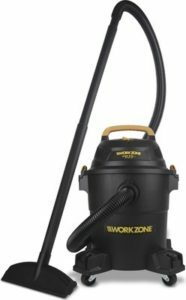 WORKZONE 6-Gallon Wet / Dry Vacuum, $39.99. Accessories include: 1-1/4″ x 6′ hose, two extension wands, floor nozzle, crevice nozzle, gulper nozzle, foam filter, disposable filter bag, reusable dry filter, and clamp ring. SOHL Furniture Writing Desk, $59.99. Measures 47.2″ x 18.8″ x 30.2″. Read my review of this desk at this link, and read about my experience with this desk’s warranty provider at this link. SOHL Furniture Executive Office Chair, $49.99. Dimensions are 41.93″ x 24.02″ x 24.41″. Read my review of a similar office desk chair at this link. Easy Home Memory Foam Lumbar or Swivel Cushion, $9.99. Pembrook 13″ Advanced Thermal Laminator, $24.99. Also available: Pembrook Laminating Pouch Set for $4.99. HP Envy 4520 Printer, $59.99. All-in-one color printer that can print, scan, and copy. Also available: Pembrook Multipurpose Paper for $3.49. Terris Surge Protector or Tabletop Charging Station, $7.99. Assorted colors. Pembrook 2-in-1 Paper Trimmer, $19.99. Measures 15.35″ x 21.38″ x 3.07″. Pembrook Dry Erase, Combo or Calendar Board, $6.99. Measures 16″ x 20″. WORKZONE Folding Hand Truck, $19.99. 150-lb. total capacity. WORKZONE Heavy-Duty 5-Tier Shelving Unit, $39.99. Measures 36″ x 24″ x 72″ with a 750-lb. total capacity or 150 lbs. per shelf. WORKZONE 2-Shelf Cabinet, $29.99. Measures 26.7″ x 15″ x 33.46″. WORKZONE 20-Gallon Latch Tote, $5.99. WORKZONE 72-Piece Socket Bit Set, $19.99. Also available: WORKZONE Universal Socket Wrench for $9.99. WORKZONE Wall-Mount Power Board, $24.99. Features Rotating LED work lights with 90-degree tilt. WORKZONE 6-Amp Jigsaw, $24.99. Includes 2 sawblades for wood, 1 sawblade for metal. WORKZONE Deck and Fence or Drywall Screws, $3.99. WORKZONE Utility Knife Assortment, $4.99. Choose from Retractable Utility Knife, Folding Utility Knife, or Wood Handle Folding Knife. WORKZONE 4-Piece Wood Chisel or 6-Piece File Set, $6.99. Features ergonomic handles. WORKZONE Garage Tool Holder, $8.99. Choose from a 4′ holder with 15 hooks or 3′ holder with 6 hooks. Ambiano Digital Food Dehydrator, $29.99. Dries fruits, vegetables, meats (jerky), herbs, and other nutritious snacks. Ambiano High-Speed Blending System, $19.99. This 11-piece set includes: 1 base, 3 cups, stainless steel blades, 1 flip-top lid, 2 solid lids, 2 lip rings, and 1 recipe booklet. Huntington Home 5’3″ Floor Lamp with 3 shelves, $39.99. Huntington Home 20″ Wall Clock, $9.99. Measures 20″ x 20″ x 2″. Huntington Home Air Freshener Candle, $1.69. Assorted scents in 4-oz. size. Huntington Home Electric Wax Melt Warmer, $5.99. Warming plate included. You also can purchase Huntington Home Scented Wax Melts for $1.69. Scents include Maple Pumpkin, Warm Apple Pie, Plumberry, or Fall Nights. Huntington Home Energy-Saving Window Curtain Panel, $9.99. Reduces noise and blocks out over 99% of light. USDA Choice Sirloin Tip Roast, $3.99 per lb. SimplyNature Family Pack Organic Grass Fed 85/15 Ground Beef, $4.49 per lb. Sold in a 4-lb. pkg. for $17.96. Family Pack Boneless Skinless Chicken Thighs, $1.69 per lb. 3-lb. avg. weight. Ambiano, Easy Home, HP, Huntington Home, Pembrook, Simply Nature, SOHL Furniture, Terris, WORKZONE. Bookmark. the workzone shop vac model 45151, do you know what the noise level is? is it very loud? Sorry, we don’t have any info about the noise level for the vacuum. If you buy it, please let us know what you think.